Marketing assessment tool and intelligence engine, powered by PR 20/20. At PR 20/20, we believe that a successful client-agency relationship starts early in the sales cycle, with the discovery process. To ensure that we can make an impact on our clients’ bottom line—and to make sure expectations are set from the start—we survey prospective clients to gain insights into specific goals, performance, processes and more. The result is more strategic, focused, and actionable conversations. PR 20/20 launched Marketing Score in September 2012 to improve the survey process. Marketing Score is an online assessment tool that examines the strength of your business and marketing foundations, forecasts potential and aligns expectations. It’s a platform for subjective analysis from the viewpoint of internal stakeholders, including sales and marketing management, and company executives. Marketing Score is based on the principle that every element of an organization, as it relates to marketing, can be divided into one of three categories: assets, neutrals and liabilities. By evaluating and scoring these elements, organizations can devise integrated marketing strategies; allocate time, money and talent; and adapt resources and priorities based on performance. Assess marketing potential and performance in four steps. Every element of an organization, as it relates to marketing, can be divided into assets, neutrals and liabilities. Assets are existing strengths that can accelerate marketing success, while liabilities are weaknesses that require additional resources to build up and improve. The platform scores more than 130 factors in 10 sections, and takes approximately 15-30 minutes to complete. Build your profile. Compare your organization’s performance to those of a similar size, with similar goals or within similar industries. Rate your performance. Give an honest assessment across core areas of performance, lead sources, marketing team, technology utilization, social media, content and public relations. Review your report. View section-by-section score summaries, visualize strengths and weaknesses, and identify opportunities to realign. Improve performance. Compare results across the organization, and move your marketing forward with aligned resources, goals and activities. See how 300+ professionals rank their marketing potential and performance. The 2014 Marketing Score Report does a deep dive on the assessment tools first 300+ engaged member responses—those who have completed at least 95% of the assessment. The average Marketing Score: 42%. Learn how hundreds of marketers, executives and entrepreneurs rate their marketing programs. 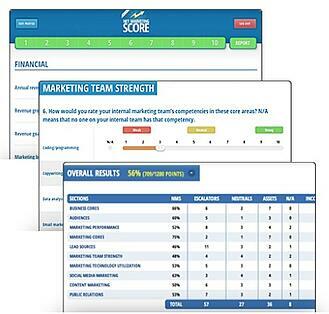 Compare your Marketing Score report to the benchmark findings. Gain insight into critical questions to consider as part of your marketing strategy. Discover how high performers excel in key marketing metrics. Get 15 tips to improve your marketing performance. Marketing industry news, and resources related to strategy and performance. The Marketing Score blog covers industry news and reports, the latest in digital strategy and performance, and practical tips on how to activate results of your own Marketing Score assessment.